Porto Zante De Luxe Villas is located on the island of Zakynthos, just west of Greece’s mainland. 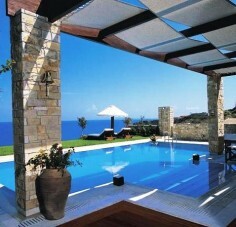 Porto Zante is a boutique resort of luxury villas, located on the private beach of a secluded bay. 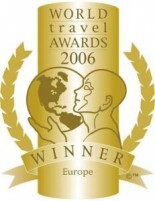 Voted Greece’s Leading Villa Resort for 2006 by the World Travel Awards and ranked as one of the top Greek resorts by Condé Nast Traveller, Porto Zante has been the choice of famous clientele that wish to relax and escape. The villas are a private home away from home where guests can enjoy gracious hospitality and round-the-clock 5 star service from the resort. The resort offers spectacular views of the endless blue waters of the Ionian Sea and of the neighboring island of Kefalonia. The four Porto Zante villas offer world class beach accommodation in one of the most coveted and luxurious holiday destinations in Europe. Porto Zante stands proudly on its own private sandy beach, in a secluded bay on the unspoilt Ionian island of Zakynthos. This boutique hideaway a truly unique resort, Porto Zante comprises four different luxury villas (from 1 to 4 bedrooms). The largest and principle villa, the ‘Imperial Spa Villa’, boasts a private heated pool and Spa on the beachfront. It was decorated and furnished by Armani Casa with antique Dionysian marble, the sleekest teak, floor-to-ceiling glass walls and the original works of art from prominent Greek artists. From all villas, the views over the Ionian Sea are dazzling and almost touchable thanks to their private paths direct to the beach and sun terraces on water’s edge. Just 10 minute away is the quaint, Venetian influenced capital with its understated cosmopolitan edge, generated by a cluster of chic bars and restaurants. On the private retreat of Porto Zante there is plenty to keep you occupied. There is a private beach, pool, spa, 24-hour Room Service, Massage Treatments, Twice Daily Maid Service, Complimentary Limousine transfers from/to Zakinthos International Airport, Bottle of champagne and fruit basket upon arrival, International newspapers & magazines delivered daily to your Suite, Famous local beaches Beach, Local restaurants, Car Hire of chauffeured Car limousine Transfer Boat Transport to some of the islands famous secluded beaches.